Book cover art by Howard Koslow. Review © 1998 by Thomas M. Wagner. One of Cabell's more enduring tales set in the magical, mythical alternate France that is Poictesme, Domnei, a "comedy of woman-worship," relates the sumptuous adventures of Perion, an outlaw who has been wrongly accused of the murder of a king. Taking refuge in the house of a count by masquerading as a prominent vicomte, Perion falls hopelessly in love with Lady Melicent, the count's sister, in the way that people can fall in love only in stories such as this one. Melicent helps Perion escape Poictesme and his pursuers, but his ship is waylaid by thugs in the employ of the ghastly heathen warlord Demetrios, and Perion is taken captive. Learning of Perion's fate, Melicent slips out of Poictesme and makes her way to the court of Demetrios, where she offers herself in exchange for Perion's freedom. Once again, it's the sort of self-sacrifice you'd only get from a character in stories like these. Naturally, Perion doggedly pursues his mission to kill Demetrios and free Melicent so that they can be together, happily ever after. A myth doesn't get much more arch than this, and Cabell's tale is in a very real sense a celebration of classic storytelling in its own right. Still, this is no mere childish fable. As always, Cabell spices up his story with a ribald, distinctly adult flavor. There's some really wicked humor at work here. Cabell can, in a single sentence, carry more emotional weight than most authors convey in reams of prose. But what really makes this story so wonderful is its subtle subversiveness. Is this really so simple a fable after all? Or is Cabell looking at romantic fantasy from just a slightly skewed, sardonic angle? Hints lie in the characterization. Perion and Demetrios, through the course of their bitter feud over the love of Melicent, develop a mutual respect for one another as adversaries. And far from being a two-dimensional villian, Demetrios gains sympathy in the eyes of, first, Melicent, and then the reader, when one becomes aware that for all his wealth and power, his tragic weakness is his inability to experience the love Perion and Melicent feel for one another. Demetrios loves Melicent too, in his own feeble way, and she ultimately comes to recognize that faint flicker of humanity within him. And what of the curious line at the story's climax, about the ultimate victory belonging to Melicent? Oh yes, folks, there's much happening beneath the surface of Domnei, much that will only reveal itself long after you've set the book down. There is much else to enjoy. A supplementary story, "The Music from Behind the Moon," is a funny little fable about the folly of love. 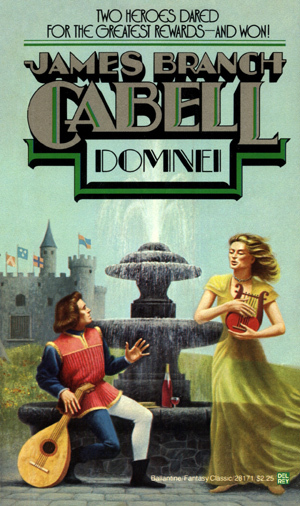 Cabell played quite a few games in his stories of Poictesme, and Domnei is linked with all of the other novels in complex ways that make the experienced Cabellian really amazed at the breadth of this mythos. Also, Cabell's prose contains joking references to other, even more ancient myths and legends that have fallen into such hopeless obscurity that reading a Cabell novel as the 21st century approaches is quite like looking into a faded, misty time capsule. But to those among you whose hearts remain alive to romance and wonder, it's a glimpse into a beautiful history you'll want to revisit again and again.